Dorothy Starbuck Landscape Painter was born and raised in Miami, Florida, where she developed a love and passion for painting the natural splendor of her beloved tropical state. She has been most influenced by artist and instructor, Dave Herbert, and historical artist, Graham Ingles. Determination, continuous study, imagination, and a desire to excel are what enable Dorothy to paint as she does. Her paintings mirror the beauty, color, and tranquility in the hundreds of tropical landscapes unique to Florida. Her works of art display an exceptional talent in painting and preserving the images of Florida’s diverse and dwindling, unique, natural features. These range from Atlantic and Gulf beaches and sand dunes to lakes, rivers, springs, marshlands, swamps, hammocks, mangroves, forests, and pastures. Dorothy works diligently to ensure all elements painted – sky, land, water, trees, palms, birds, and botanicals – are accurately portrayed. Colors and textures are precise and vivid. Her representational style conveys the calmness and serenity she feels while sketching or taking photographs in the field. Her powers of direct observation, pursuit of excellence, and ability to capture the nuances of color, light and shadow give her paintings an authentic feel. Oil painter Richard Schmid, with his marvelous capture of mood and light, is an example of an artist who inspires Dorothy. His work moves her to reach beyond herself and paint the very best for corporate and private patrons who collect her paintings. To commemorate the 50th anniversary of Camp Pinchot at Eglin Air Force Base, the United States Air Force commissioned Dorothy to produce a painting, which is a part of their permanent collection. As an active member of the Everglades Artists for many years, Dorothy has served as director, demonstrator, and workshop facilitator. She has been awarded first place and best of show in many Everglade membership competitions including her pieces “Sea Oats” and “Mountain and Waters”. The City National Bank of Florida in Miami commissioned Dorothy to create a Florida landscape which hangs permanently in their Greynolds Park branch since 1988. She was selected by the Walton County Tourist Development Council as its first “Artist of the Year 2002 – 2003”. In 2003 she was the Friends of the Coastal Branch Library’s featured artist for its first exhibit. Fifteen of her oil paintings were exhibited in the juried show “Heat Wave – Perspectives in Oil and Bronze” along with four other Florida artists in 2004 at the Backus Gallery and Museum in Fort Pierce, Florida. The Elliot Museum in Hutchinson Island, Florida showcased Dorothy’s landscapes, along with sculptor Geoffrey C. Smith also in 2004. In 2005 Dorothy exhibited in a show entitled “Florida, an Enchanted Land” at the Historic Bok Sanctuary Museum in Lake Wales, Florida. Her paintings have been featured in the Florida State Capital in Tallahassee and at the Cannon House Office Building in Washington, D.C.
Dorothy’s talents extend beyond the canvas. As an actor she received rave reviews for her performance as the lead in the play “The Girls of the Garden Club” in March 1999. 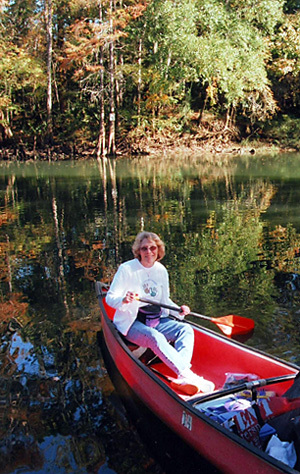 The Point Washington State Forest and the Choctawhatchee bayou surround Dorothy as she paints in her home studio. She lives in Santa Rosa Beach, Florida, with her husband, Bob. They have three daughters: Bonnie, Kathryn, and Linda and seven grandchildren.